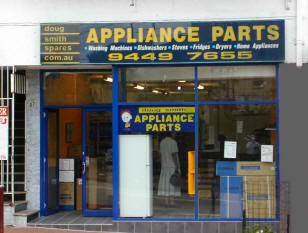 Appliance Spare Parts Sydney – Call Granville Store ph. 02 88686700. Pymble store Ph 02 9449 7655. We offer you same day delivery if you’re in the Sydney metro area, including Blue mountains and Central coast. Same day delivery includes western suburbs, Parramatta, Bankstown, Campbelltown, Penrith, Hills District, North shore, Chatswood, Hornsby, Sutherland Shire, Cronulla, Eastern Suburbs, Bondi Junction, Northern Beaches, Manly, Deewhy, Mona Vale, Blue Mountains, Central Coast, Gosford Wyong. Our Sydney Stores stock genuine appliance parts for brands such as: AEG, Andi, Ariston, Blanco, Bosch, Chef, Delonghi, Dishlex, Electrolux, Euro, Fisher & Paykel, Haier, Hoover, IAG, Ilve, Kelvinator, Kleenmaid, LG, Midea, Nobel, Omega, samsung, Smeg, Simpson, St George, Technika, Westinghouse, Whirlpool and spare parts for loads of other brands as well.